In case you haven’t heard of them before, Bunchems are sticky orbs of plastic with tiny hook-like projections that you can squish together into fun shapes. We have reviewed Bunchems Bunchbot in the past, and were happy to expand our Bunchems repertoire with the new Unicorn theme pack. This Unicorns pack comes with 5 variously coloured Bunchems, some of which glow in the dark. 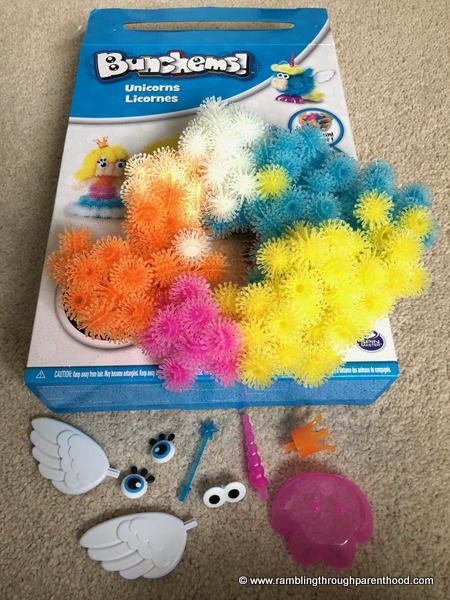 The pack includes 200 Bunchems, a selection of accessories (2 pairs of eyes, a pair of wings, a pink base, a wand, a crown and a horn) and an instruction sheet with ideas to create some fairies and unicorns. I don’t mean to be sexist or typecast, but my 7 year old son was having none of the fluffy pink unicorn stuff. 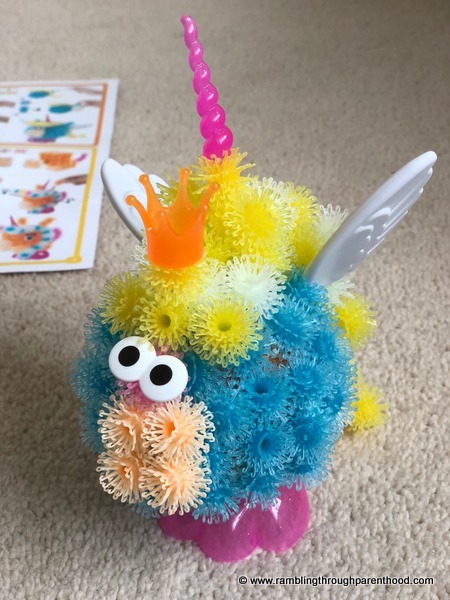 So while I followed instructions to try and create a fairy, he got busy squishing Bunchems in order to create a ‘Pigicorn’ – a cross between a pig and a unicorn. To be fair, he too was following a pattern detailed in the instruction sheet. And it did look more like a pig with wings than a unicorn. So fair play to him, I say! 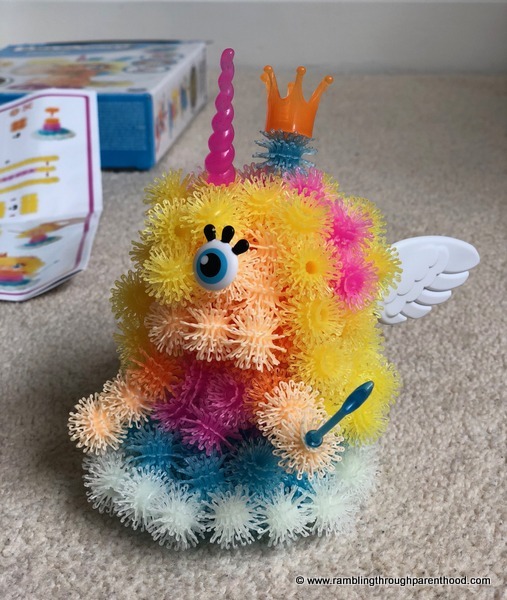 We improvised with the accessories, giving my one-eyed fairy a horn and wings, while the Pigicorn got saddled with a crown. It was easy to create with the Bunchems. They tend to latch together easily. Creating a ball-like mass is simpler that sticking them together in neat rows. Also, shorter lines are sturdier than long flowing rows of Bunchems, as we discovered when making golden locks for our Pigicorn. The plastic accessories stick firmly into holes on individual orbs. You can then squish them into place on other Bunchems. A word of caution, though. Make sure to keep Bunchems away from hair. They tangle easily and are a nightmare to get out. Keep them off carpets as well, for they adhere vehemently to fibre as well. We restricted our play to the play mat, and got on okay. Other than that, Bunchems are great for creativity. They are easy to put together and pull apart, so you can create with them over and over again. The Unicorns theme pack is available for £12.99 and is aimed at children 6+. 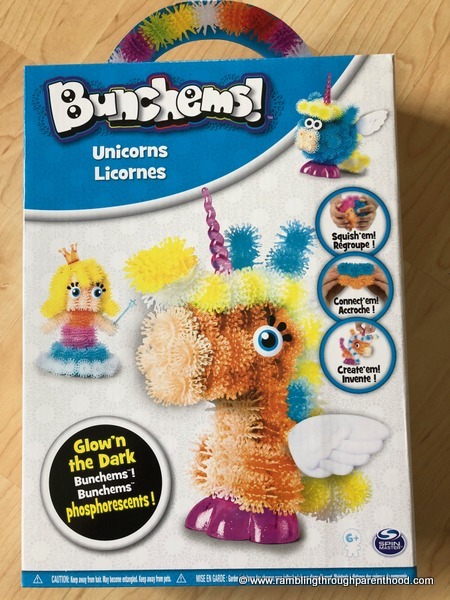 Disclosure: We were sent a Bunchems Unicorns Theme Pack for the purpose of this review. All opinions are my own.